"Indeed, God has given us a test worthy of a God. And only those worthy of becoming among the gods will be able to solve the riddle. Because only they will humble themselves, come with a contrite spirit and broken heart to offer upon the altar a sacrifice worthy of being accepted. Others will proceed in ignorance and arrogance to proudly proclaim: "I know my culture is true!" "I know all is well in Zion!" "I follow a broad and safe mainstream into a great and spacious building where there is peace, pride, success, prosperity and assurance that I am saved while all around me there are those who will be cast down to hell!" Or similar such nonsense... Warmed over Evangelical gibberish, with a vague Mormonesque vocabulary applied to it. Having a form of godliness, but without power. This new form of ungodliness will not be lacking in body, parts and passions, for the image of the idol raised will be the very image of the person looking in the mirror. They will think themselves destined to rule and reign over principalities, dominions, heights, depths and others. They are their own idols! What irony it all invokes! It must make the devil look up to heaven and laugh still. (Moses 7: 26.) Perhaps we ought to see some humor in it as well. ...Or, since we're speaking of the loss of men's souls, maybe it can never be humorous. Only tragedy. Only disappointment. Only foolishness. "Who is Nephi describing? Is it possible it could apply to us along with all other organized faiths? "I have often heard my fellow-Saint speak of the sense of pride the Conference Center gives them. It is a great, spacious and technologically advanced center. 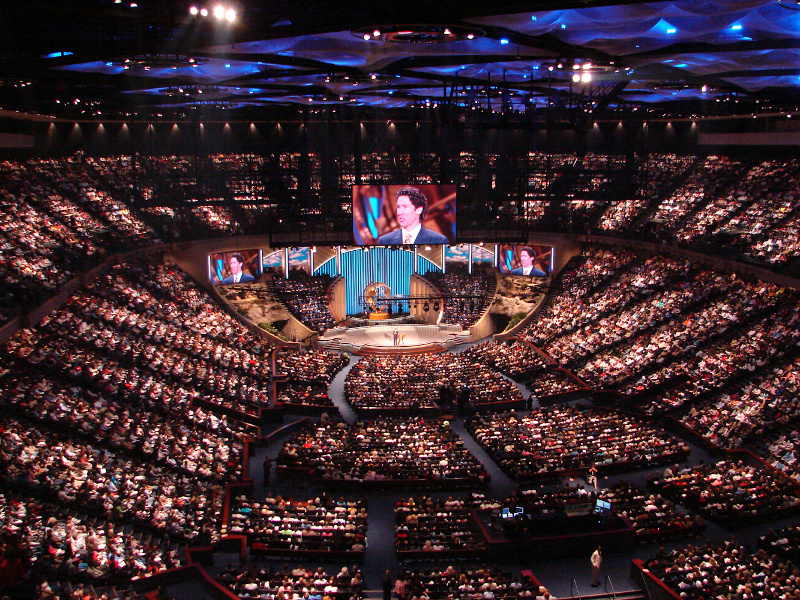 I've thought the ceiling of that building looks somewhat like that very successful evangelist Joel Osteen's amazing church. 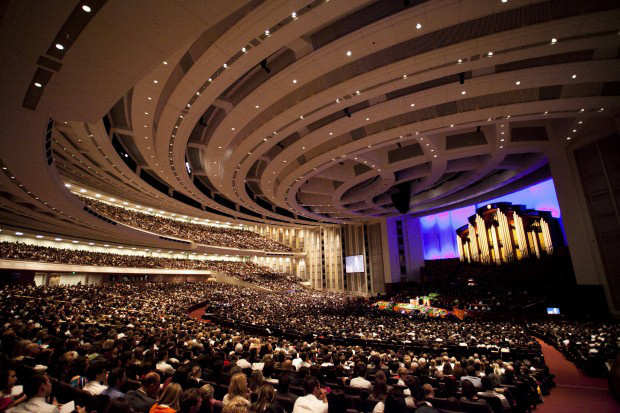 I've wondered if the architectural firm took hints from other successful mega-churches when designing the Conference Center. Have you noticed how the dimmed lights and the magnified images, magnified voices and focus upon the great pulpit is designed to use all the modern audio-visual technology to create heroic images within the building for the audience? It is a technical marvel. Really state of the art. It is hard for me not to take some pride in it all. Anyone who wonders if our church is respectable, successful, powerful or advanced, who visits the facility will no doubt leave with the conclusion that, despite our humble origins, we certainly have made a success in the world for ourselves. It is a story of overcoming and prospering.